As senior housing providers strive to distinguish themselves from marketplace competitors, while simultaneously trying to keep costs down, some are shifting their approach when it comes to investing development dollars into their communities. Senior housing developers are still bullish on new development, despite data showing annual inventory growth at its strongest pace since 2009, according to the most recent data from the National Investment Center for Seniors Housing & Care (NIC). For those anxious about oversupply, the good news is that the rate at which new senior housing projects are breaking ground was at its weakest pace in a year, as of the first quarter of 2016. Even with this marked slowdown in construction activity, NIC notes there continues to be a number of units currently under development, which as they come online, will only increase the need for providers to stand out amongst their competitors, according to a group of senior housing developers and design experts during the Senior Housing News Summit in Washington, D.C. last week. “Even though the NIC data might have been soft, there is a lot of confidence out there,” said Scott Gensler, vice president of business development and corporate affairs at Erickson Living. Based in Baltimore, Erickson Living is one of the nation’s largest senior housing providers serving a resident capacity of more than 28,000 across 19 communities nationwide. The company is highly active on the construction front, having just recently finished a record year for development in 2015, in which it completed construction for five new residential buildings. As previously announced, Erickson plans to continue its development momentum in 2016 with 23 construction projects budgeted in eight states and plans to add more than 1,850 units for an estimated construction pipeline of $565 million. As Erickson develops new properties with a focus on delivering a product that is in-line with consumer expectations, the company has seen more of an interest to spend square footage dollars in resident units rather than community spaces, Gensler said. This shift is representative of the ever-evolving preferences of the industry’s future resident consumers, particularly in moving away from design that focuses on communal areas and amenities, and instead concentrates on individual living spaces. Developing and designing a product that people want to live in is important for senior housing providers to attract residents to their communities. But while most people may want bigger units, at some point it doesn’t become economically viable to give everyone a 3,000-square-foot condo layout. “They say they want more square footage, but what they really want is livable space,” Gensler said. Creating livable spaces for residents to enjoy requires more thought than simply adding additional square footage to a floorplan. The difference is a matter of function; how residents use the actual space in their everyday lives. Erickson predominantly develops and manages continuing care retirement communities (CCRCs). In each market before Erickson builds, the company does an analysis to make sure it is developing a product that is expected and that people are willing to pay for. As the third-largest independent living provider in the U.S., many of the residents Erickson attracts are about 80 years old—younger than the average age of assisted living residents, who are typically in their mid-80s and older. This younger cohort has different needs than older residents. In Erickson’s experiences, the company finds these “younger” consumers are demanding the same expectations as residents of non-age restricted housing. To accommodate these changing preferences, it becomes important for providers, when developing communities, to consider where they are focusing their square footage. 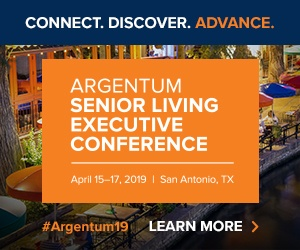 In the past, senior housing designers were creating outdoor dining as an extension of the kitchen, said Dan Cinelli, managing principal for architecture firm Perkins Eastman. As construction costs rise, developers like Houston-based PinPoint Senior Living are downsizing community common areas to add more revenue space in the form of bigger units and more functional spaces. PinPoint, which has about 14 communities open or under development across the southern U.S., employs a prototype approach. This prototype, which is always evolving, allows PinPoint to build upon and enhance the design of its communities depending on the market. As PinPoint tweaks its prototype to optimize revenue, the company is making common spaces less multi-purpose and more multi-functional. The company’s “third-generation” buildings feature larger units and bigger closets compared to its other communities, as well as market competitors.